By default the 'default implementation' us used by the Context-Aware Configuration concerning lookup and persistence of configuration data, resource and property inheritance and context path detection. Using the SPI it is possible to overlay, extend or replace this functionality. This page documents the details of the default implementation. By default all configuration data is stored in /conf. Fallback paths are /conf/global, /apps/confand /libs/conf. The paths are configurable in the service configuration. The content resource hierarchy is defined by setting sling:configRef properties. Each resource that has a sling:configRef property set defines the root resource of a context, the whole subtree is the context. Within the subtree further nested contexts can be defined. 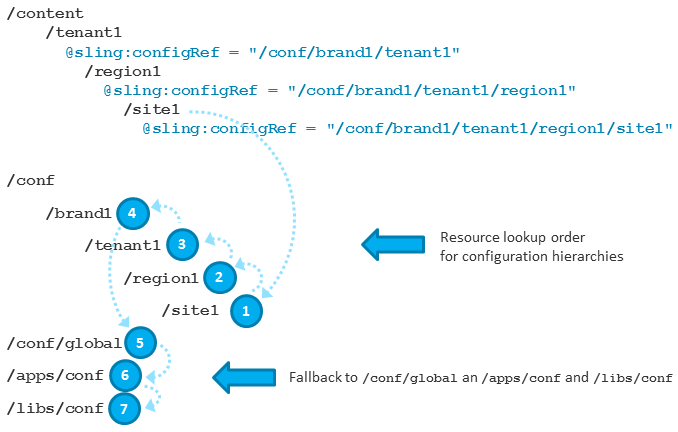 Go up in the content resource tree until a resource with sling:configRef is found. This is the 'inner-most' context. Check if a configuration resource exists at the path the property points to. sling:configs is the bucket named which is used by the ConfigurationResolver by default for context-aware configurations. May be another name if you use the ConfigurationResourceResolver directly. x.y.z.MyConfig is the configuration name, in this case derived from an annotation class. May be any other custom name as well. It is possible to use deeper hierarchies below sling:configs as well. Nested configurations are supported as well. This can be mapped to annotation classes referencing other annotation classes. For singleton resources, there is not resource inheritance. The first resource that is found in the configuration resource resolving lookup order is returned. For collection resources there is no resource inheritance enabled by default. The children of the first resource that is found in the configuration resource resolving lookup order are returned. By defining a property sling:configCollectionInherit on the configuration resource, the children of the next resource that is found in the configuration resource resolving lookup order are combined with the children of the current configuration resource, returned a merged list. If both configuration resources contain child resources with the same name, duplicates are eliminated and only the children of the first resource are included. By setting the property sling:configCollectionInherit on multiple configuration resources that are part of the lookup order it is possible to form deeper inheritance chains following the same rules. The result of this example is: C, A, B. It would by just C if the sling:configCollectionInherit is not set. By default, no property inheritance takes place. That means only the properties that are stored in the configuration resource are mapped to the annotation class or returned as value map, regardless whether singleton or collection resources are returned, or if resource collection inheritance is enabled or not. By defining a property sling:configPropertyInherit on the configuration resource, property merging is enabled between the current configuration resource and the next resource with the same name (singleton or resource collection item) in the configuration resource lookup order. That means that all properties that are not defined on the current configuration resource are inherited from the next resources and a merged value map is used for the configuration mapping. By setting the property sling:configPropertyInherit on multiple configuration resources that are part of the lookup order it is possible to form deeper inheritance chains following the same rules.